Oh, I'm off to read it right now. I loved her New Moon in 15 minutes. I've never seen the movies (didn't really care for Twilight, the book), but these posts are entertaining! I actually have been looking forward to reading this for a while. Thank you for introducing me to the hilarity! I saw the movie. It was good...for what it was. But Jasper still really just bugs me. His hair has improved somewhat, but he always looks like he has a stick somewhere a stick shouldn't be. 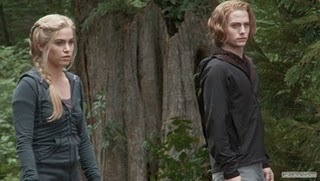 Edward was better this time, and the whole tent scene between him and Jacob was perfect. It's not often a movie adaptation gets something so close to my imagination, but that did it. Thanks for sharing! They are hilarious. Have you seen Eclipse with cats by popsuede? You can see it over here. So hilarious! Let me click on your link of Eclipse in 15 minutes. I have a feeling I'm going to like it as well. I did watch the movie with two friends. I watched Twilight and New Moon with both of them and it has become a tradition now. We will finish watching the movies all together. They didn't read the books so they kept asking me during the movie, "Did that really happen in the book?" Thanks for the link! I hadn't heard of this site, but it was hilarious! Brenda, they certainly are. I admire that amount of talent, I really do. A good parody is so hard to craft. Chachic, lol. That's funny. It's true that the main enjoyment in watching these movies is the experience of watching it together with your friends. So you can laugh and talk and generally live it up. Jen, oh man. Cleo is awesome. Definitely check out her HP parodies.